Posttransplant lymphoproliferative disorder (PTLD) is a rare but serious complication of both solid organ and bone marrow transplantations. PTLD represents a diverse and heterogeneous group of lymphoproliferative disorders, ranging from abnormal lymphoid hyperplasia to frank malignant neoplasms. PTLD accounts for >20% of secondary cancers following solid organ transplantation. PTLD is the second most common malignancy in adults and the most common malignancy in children, following transplantation. In adult renal transplant recipients, PTLD has been reported up to 2.3% of cases. Most of the PTLDs are B-cell in origin, and only 10% of them are T-cell in origin. T-cell PTLDs represent the most aggressive neoplasm that are less responsive to conventional therapy. In general, PTLDs are associated with Epstein–Barr virus (EBV) infection. The development of PTLD is majorly determined by the degree of immunosuppression. According to the World Health Organization 2008 classification, PTLDs can be classified into early lesions, polymorphic PTLDs, monomorphic PTLDs, and Hodgkin-like PTLDs. The course of the disease varies from indolent localized lymphadenopathy to rapidly progressive fulminant disease. 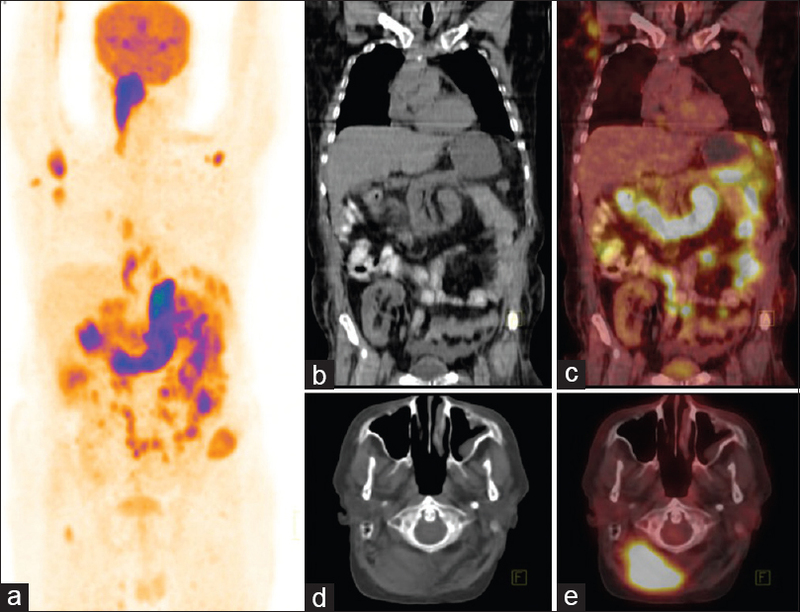 18F-fluorodeoxyglucose positron emission tomography/computed tomography (18F-FDG PET/CT) is the imaging modality useful in staging and evaluation of treatment response in patients with lymphoma. It increases the sensitivity and specificity of disease assessment over conventional imaging with CT, detecting additional disease sites, with modification of clinical stage in 15%–20% patients (50% in children), altering patient management or outcome in 10%–15% (23% in children). In this review, we present a case report of postrenal transplant lymphoproliferative disorder which was detected in 18F-FDG PET/CT. A 39 year old male patient, renal allograft recipient, reported to the nephrology outpatient department, with the complaints of evening raise of temperature, loss of appetite, loss of weight, exertional breathlessness, and cough without expectoration for 10 days. There was no history of oliguria, hematuria, or dysuria. The patient was started on antitubercular drugs, in view of high-risk transplant status. The patient was screened for infection/inflammation and lymphadenopathy. 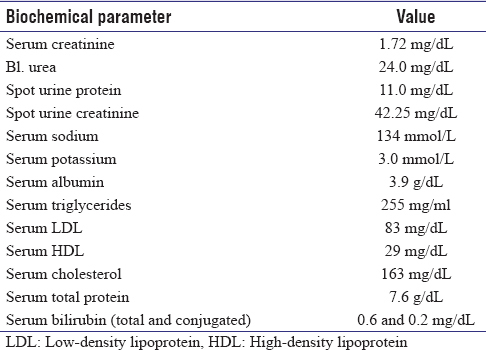 His biochemical parameters are as listed in [Table 1]. 18F-FDG PET/CT was done, following Society of Nuclear Medicine/European society of Nuclear Medicine (SNM/EANM) standard operating procedure guidelines by injecting 300 MBq of 18F-FDG intravenously, and imaging was done after 60 min. 18F-FDG PET/CT findings showed metabolically active small bowel loop thickening with extensive infiltration of adjacent mesentery and fatty tissue and metabolically active soft tissue deposits in the anterior abdominal wall, right posterolateral wall, bilateral axillary, mediastina, abdominal lymph nodes, and soft tissue deposits in the right lower occipital muscle [Figure 1]. With these findings, we suspected lymphoproliferative disorder and advised for fine-needle aspiration (FNA)/biopsy, from any of the metabolically active lymph nodes. FNA cytology (FNAC) was done from abdominal lymph node, which showed many red blood cells (RBCs), lysed RBCs, few small clusters, and discretely lying atypical lymphoid cells with mild pleomorphic vesicular nuclei with scanty cytoplasm, which is more in favor of non-Hodgkin's lymphoma (NHL). 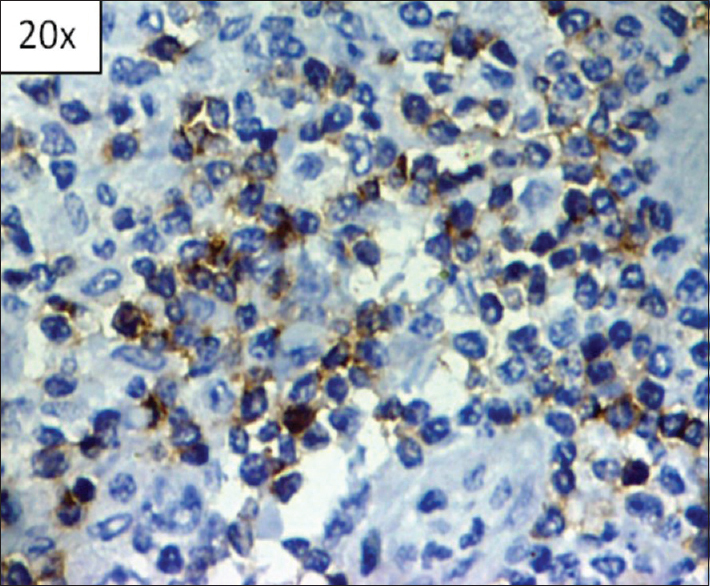 Further, immunohistochemistry evaluation revealed that the tissue is positive for CD3 and negative for CD19 and CD 20, which confirmed it as T-cell variant of NHL [Figure 2]. Then, the patient was referred to the medical oncology department, where he was treated accordingly and his symptoms subsided. Unfortunately, the patient was lost to follow-up. The treatment of choice for end-stage renal disease is renal transplantation. PTLD is one of the serious complications following transplantation. PTLD is increasing in prevalence as the number and survival length of solid organ and bone marrow transplant recipients are increasing. It is the second most common type of malignancy in adult posttransplant patients after nonmelanoma skin cancer, with two peaks demonstrating first at 1-year posttransplant and second at 4–5 years posttransplant. EBV infection, concomitant cytomegalovirus infection, and the use of immunosuppressive drugs are the major risk factors for developing PTLD. Five-year survival rate in PTLD is 35%, so it is essential to diagnose PTLD early so that the prognosis can be improved. 18F-FDG PET/CT has known benefits in the management of Hodgkin and non-Hodgkin lymphomas and is now considered the standard of care in the initial disease staging and subsequent monitoring of these malignancies. This case study suggests that 18F-FDG PET/CT imaging has advantages over the cross-sectional imaging modalities in the initial disease assessment and the staging of PTLD as CECT cannot be done in the renal transplant patients. A potential significant benefit of 18F-FDG PET/CT in patients with PTLD is its ability to help resolve equivocal clinical or imaging findings and detect disease extent and help to identify the site from where biopsy/FNAC can be done. Christopher et al. in a retrospective analysis which included thirty PTLD cases found that in 57% of cases, 18F-FDG PET/CT detected occult lesions not identified on other imaging modalities and also suggested malignancy in equivocal lesions. 18F-FDG PET/CT appears to be beneficial for the initial evaluation of patients with PTLD, providing added benefits when compared with conventional imaging modalities. 18F-FDG PET/CT can be effective in cases with equivocal findings on other imaging modalities and for the detection of occult disease and in identifying the site from which biopsy can be done. Muscle deposits in PTLD are better appreciated in 18 F-FDG PET/CT. We would like to thank the Department of Nephrology, Department of Radiology, and Department of Pathology. Borhani AA, Hosseinzadeh K, Almusa O, Furlan A, Nalesnik M. Imaging of posttransplantation lymphoproliferative disorder after solid organ transplantation. Radiographics 2009;29:981-1000. Kirby AM, Mikhaeel NG. The role of FDG PET in the management of lymphoma: What is the evidence base? Nucl Med Commun 2007;28:335-54. Taylor AL, Marcus R, Bradley JA. Post-transplant lymphoproliferative disorders (PTLD) after solid organ transplantation. Crit Rev Oncol Hematol 2005;56:155-67. Nelson BP, Nalesnik MA, Bahler DW, Locker J, Fung JJ, Swerdlow SH, et al. Epstein-Barr virus-negative posttransplant lymphoproliferative disorders: A distinct entity? Am J Surg Pathol 2000;24:375-85. Gross TG, Bucuvalas JC, Park JR, Greiner TC, Hinrich SH, Kaufman SS, et al. Low-dose chemotherapy for Epstein-Barr virus-positive posttransplantation lymphoproliferative disease in children after solid organ transplantation. J Clin Oncol 2005;23:6481-8. Seam P, Juweid ME, Cheson BD. The role of FDG-PET scans in patients with lymphoma. Blood 2007;110:3507-16. Camacho JC, Moreno CC, Harri PA, Aguirre DA, Torres WE, Mittal PK, et al. Posttransplantation lymphoproliferative disease: Proposed imaging classification. Radiographics 2014;34:2025-38. Halkos ME, Miller JI, Mann KP, Miller DL, Gal AA. Thoracic presentations of posttransplant lymphoproliferative disorders. Chest 2004;126:2013-20. Parker A, Bowles K, Bradley JA, Emery V, Featherstone C, Gupte G, et al. Diagnosis of post-transplant lymphoproliferative disorder in solid organ transplant recipients-BCSH and BTS guidelines. Br J Haematol 2010;149:675-92.